Budapest is a beautiful city, and at night even more so. 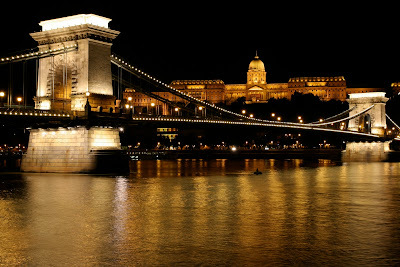 But around Christmastime, Budapest at night is truly spectacular! So this past weekend, we bundled the kids up in their snowsuits, put Sweet Pea in the stroller with her thick, sheepskin foot sack, and took to the streets in the dark. It's Christmas market season here, and the main Christmas market downtown is a popular sightseeing stop with tourists. Since my friend was visiting (actually, a former student - now aged 30! egad! ), we went to see the Christmas lights around the market. The girls were fascinated by the lights. Princess Pea was particularly excited to see the long strings of them hanging down like icicles from the sides of the big hotels and shops, since the day before we had seen the workers rappelling down the buildings, in the process of putting up those same lights. These ones were cleverly designed to look like balls of mistletoe growing in the trees. and, of course, we had to buy some of Hungary's famous kurtoskalacs for my friend to sample! Mmmmm. So last week's Outdoor Play Party had some pretty great posts linked up! 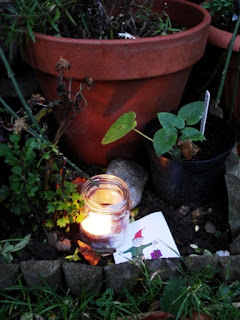 It was very hard to choose one favourite, but Sunhats and Wellie Boots' Candlelit Elf Hunt was just so magical I have to share it!